The Legal Marketing Association has awarded the Quarles & Brady website First Prize in the category of "Total Website Refresh/Overhaul/Rebrand" at this year’s Your Honor Awards. 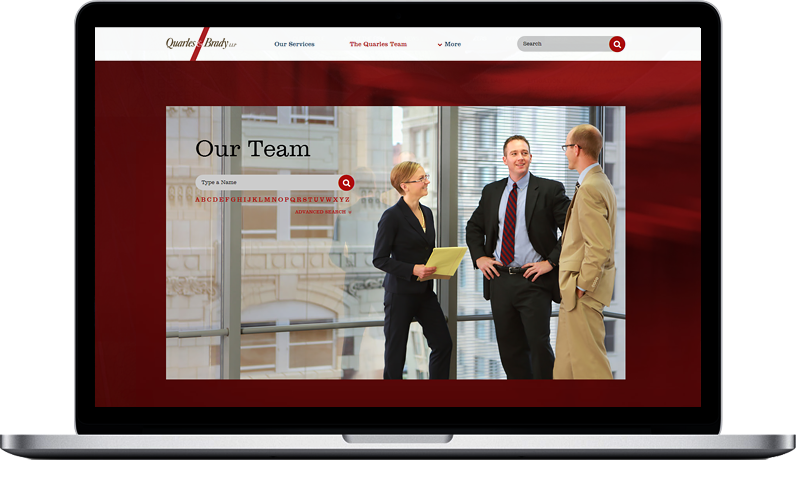 Quarles and Brady, a national law firm with over 475 attorneys in 11 offices, partnered with Great Jakes to design and develop a website that would help position Quarles & Brady for success in today’s hypercompetitive, internet-centric legal marketplace. The Your Honor Awards is the longest-running annual national award program for recognizing excellence in legal marketing. Quarles & Brady received the prestigious award during a ceremony at the 2015 Legal Marketing Association’s annual conference, held this year in San Diego. Attorney Microsites. The website was built with "Attorney Microsites"—functionality that Great Jakes pioneered that provides each of the firm's attorneys with small, highly customizable websites. An attorney's microsite could display podcasts, video, PowerPoint presentations, and twitter and blog feeds, as well as "custom pages" to highlight a specific aspect of an attorney's practice. Rainmaker Stats Dashboard. This proprietary tool developed by Great Jakes provides a snapshot of a user’s activity at the firm’s website, as well as on each individual attorney-microsite and/or practice-area microsite. This allows the marketing department to easily share granular, actionable data such as the names of the companies that have visited a particular attorney-bio or practice area. Engaging Photography. The website features large, engaging photos of the firm’s attorneys “in action.” These photos were shot by acclaimed photographer Peter Olson during a 12-day photo shoot at nine of the firm’s offices. The photo shoot was art directed by Great Jakes. Responsive Design Mobile Functionality. The website utilizes “responsive design,” a new standard for mobile websites that allows for a smooth user-experience, whether someone's using a smartphone, tablet—or even a large desktop monitor.